College Horizons is a nonprofit organization that encourages and facilitates the higher education of Native American, Native Hawaiian, and Alaska Native youth. This year marks the 20th anniversary of our annual week-long pre-college summer program for high school sophomores and juniors. Our programs provide hundreds of Native students the opportunity to travel to one of our partner college/university host sites for a six-day “crash course” on the college application process. At each program, there are approximately 100 students working alongside 20 college counselors and 40 college admissions officers to complete the rigorous curriculum. Students experience life on a college campus and work among small groups to research their top ten schools, complete the Common Application and college essays, fill out a preliminary FAFSA, and receive interviewing skills and test-taking strategies (on the ACT and SAT tests). We are proud to say that 99 percent of students who attend College Horizons attend a four-year university and of those, 85 percent graduate within four to five years. We are the only program of our kind­– focused solely on serving the unique needs and experiences of Native students throughout the nation and bringing that perspective into the college selection and application process. College Horizons was founded 20 years ago by a high school counselor, Dr. Whitney Laughlin, at the Native American Preparatory School (NAPS) in Rowe, New Mexico in order to address the college access gap for Native American students. It began with the premise that talented, high-achieving Native high school students were not receiving quality academic advising and college counseling. While we have been successful in our work and have seen growth in college enrollment across the United States, fewer than half of Native American students graduate from high school and only about one in 20 will attend a four-year college or university . In 2010, our current Executive Director Carmen Lopez, assumed the directorship with the goal to create a larger success program, grow college partnerships, create a professional development program for college admission officers and Tribal educators, and strengthen the organization’s capacity and sustainability. We have only continued to expand, now offering two additional opportunities– Graduate Horizons, which serves college students/graduates and the Scholars Program, which serves first-year college students. This comprehensive approach enables College Horizons to build a more robust pathway for students. Today our core mission remains– to increase the higher education rate of Native youth by providing pre-college (College Horizons), pre-graduate (Graduate Horizons), and student support services (Scholars Program) to Native American, Native Hawaiian, and Alaska Native students. It’s important to understand that the Native experience is very diverse – whether students come from reservations, live in border towns, are in the suburbs or urban areas away from homelands – Native students all have different experiences. We also have unique political and cultural statuses, as citizens of sovereign nations. Institutions have to do their part in learning and better understanding the complexity of our communities, cultures and traditions. Colleges cannot simply bring Native faculty and students to their campuses, they must also commit to providing resources and acknowledging the Indigenous campus community. These institutions were not made for us, yet we know many of our program alumni continue to be change-makers on their own college campuses, fighting for increased visibility and support. Native students should never have to sacrifice their own ways of knowing in pursuit of a higher education. To learn more about College Horizons, follow them on Facebook, Instagram or Twitter. (Brayboy, Bryan, Postsecondary Education of American Indian and Alaska Natives: Higher Education for Nation Building and Self-Determination. ASHE, Volume 37, Number 5). Dinée Dorame is the associate director of College Horizons. She is a citizen of the Navajo Nation and is from Albuquerque, NM. She is Tábąąhá born for Naakai Dine’é. Her maternal grandfather’s clan is Tótsohníí and her paternal grandfather’s clan is Naakai Dine’é. Dinée is a 2009 College Horizons alumna and received her B.A. in Women’s, Gender, and Sexuality Studies from Yale University in 2015. 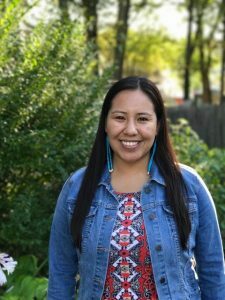 In her previous position, she served as an Assistant Director of Undergraduate Admissions and the Native American Outreach and Recruitment Coordinator in the Yale Office of Undergraduate Admissions. At Yale, she dedicated her time to supporting Native students as a first-year academic adviser and fellow for Ezra Stiles Residential College.